There is a problem in this world, and it is only getting worse. As I’ve documented here before, the grocery store keeps pushing green bananas on me and the entire buying public. I am convinced it is an intentional deception, a banana conspiracy of global proportions no doubt propagated by Big Fruit like Chiquita and Dole. They have congress in their deep pockets and own the USDA. It is time we open our eyes to the fact that they are shoving bad bananas down our gullible little gullets by redefining what “fruit” is. My conviction that we need a massive banana re-education campaign was strengthened by the dastardly events of Saturday afternoon. Let me explain. I had finally made my way to the produce aisle of the grocery store (our local HEB, a rather large chain of stores in Texas) and was looking for fruit. There was lots of produce, but most of it was green, like the pineapple I bought. It will not be ripe for another three or four days now. I can get fresh onions, tomatoes and local produce at the farmer’s stands that are harvested when ripe and sent to to market but I can’t get pineapple locally grown, nor can I get what I really wanted: Bananas. I have to rely on the big grocer to get me my banana fix. I saw the bunch of bananas that I wanted. They were almost perfect, which is hard to find. The peel had started browning with those tell tale blotches that signal the banana is reaching its peak flavor. I was almost to this bunch of bananas when an evil agent of Big Fruit, under the guises of a teenage employee of the produce department, reached his grubby paw in and snatched the very batch of bananas I wanted. In one fluid motion he tossed these bananas underneath his cart into a box that also had grapes and strawberries in it. It took everything in me not to assault him with a cantaloupe (a green cantaloupe, mind you) and take those bananas. He was such an arrogant little thing, the Produce Nazi, who, like a true bureaucrat, hides behind the ‘rules’ in order to avoid the painful process of thinking for himself. Rise Up, banana lovers. Rise Up. Yes We Banana! Brainwashed I may be, but prefer yellow banana’s I do. oh, dear! Think you would have probably had me arrested for banana abandonment if you saw the banana I threw away. Have you had a chat with the produce manager? If he knows that there is a market available for older fruits, he may part with them. It is all about sales. i have not spoken to produce manager, but likely will in the future. you are right, sales usually trump all, but there is also a great deal of fruit ignorance and fruitism out there that often trumps even profit margins. hahahahahahahahaha. If you can’t tell, that made me laugh, quite a bit! I do not like brown bananas. Once they get that way, the inside starts to turn mushy and brown as well. 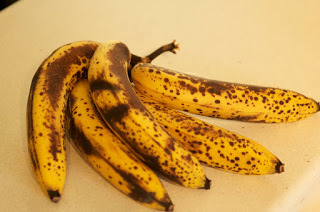 I eat them as quick as I can but often find brown spots inside, and its just as gross as a green banana. I like my bananas yellow. just yellow. Because we grew up poor the only bananas we got we’re the ones that were turning brown. Which spoiled me because I don’t like them any other way.